The original Moor Beer started brewing in 1996 and shut in 2005. In 2007 Californian Justin Hawke bought the company and started it fresh again, ditching some brands, adding new ones, and reworking the rest. The current Moor Beer is entirely different to the original, which is listed on Ratebeer as Moor (-2008). The brewery is now recognised as one of world’s best, setting the benchmark for several beer styles. 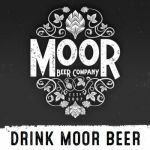 Moor Beer is also the leader of the unfined ’natural’ beer movement in the UK. Their beers can be found in many countries. All beers (even keg) are naturally conditioned with live yeast. In 2014 the Brewery moved from Somerset into Bristol and combined with a Brewery shop.